Southern Utah’s original and favorite outdoor summer movie series features the best in family entertainment. 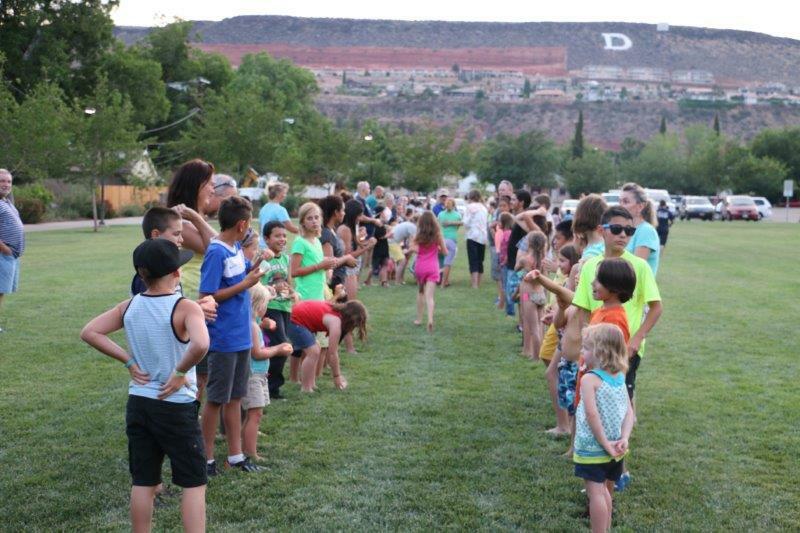 Sunset on the Square (SOTS) will feature the movie Mr. Peabody and Sherman on Friday, July 10, 2015 at Town Square Park in Historic Downtown St. George. Sunset on the Square is a partnership between Write It Up! and the City of St. George. Now in its seventh year, the summer movie series features free movies at dusk played on a giant screen under the beautiful starry nights of Southern Utah. “It has been a great summer for Sunset on the Square, and we are looking forward to so much more this season!” said Dawn McLain, Write It Up! Owner and SOTS Event Coordinator. “It has been a great summer for Sunset on the Square, and we are looking forward to so much more this season!” said Dawn McLain, Write It Up! Owner and SOTS Event Coordinator. The free family oriented movies are shown on the 2nd and 4th Friday’s each month until August. The festivities take place on the quad of the Town Square Park in downtown Saint George (86 S. Main St.) right in the heart of the Downtown St. George District. The movies offer a mix of classic family movies and recent hits. Each event starts at 6:00 pm with an array of food, games, prizes, face painting and dancing. The movies will begin at dusk, between 8:30 pm and 9:00 pm. So if you’re looking for something to do on a Friday night, be sure to bring blankets, lawn chairs, friends, and family to enjoy a free movie night under the stars. July 24 – Pioneer Day Celebration: Pre-movie events will include the Pioneer Day Games, a family field day style program with prizes, LOTS of fun and something for everyone from toddlers to seniors! After the movie, the City of St. George will host a fireworks show at Town Square Park. August 28 – Chamber Night: Our Grand Finale of the season will be the St. George Chamber Night. Chamber members receive special rates for booths, and recognition of their efforts to build and support local businesses. July 24 Three Amigos PG 103 min. August 14 Wreck it Ralph PG 108 min. August 28 Legend of Zorro PG 136 min. Please save the date to join the Sunset on the Square team at Town Square Park, every 2nd and 4th Friday of the month starting now thru the end of August 28, 2015. Come early to enjoy the park and carousel and to make sure you get the best seats in the house. The fun starts by 6:00 with food, vendors and fun including the Dealer Collision Water Balloon Challenge and conga lines, hokey pokey games, prizes, splash pad, face painting, lots of activates and more led by event Master of Ceremonies, Dawn McLain. Sunset on the Square is proudly sponsored by KCSG Television, The Falls Event Center, St. George News, Southern Utah Cares, BioLife Plasma Services, Cherry Creek Radio, The Independent, Family & Kids Magazine, View on Southern Utah Magazine, The City of St. George, Write It Up!, Williams Services, The Dixie Elks Lodge, Brad Harr & Associates, Dealer Collision Center, Sonny Boy’s BBQ, and Steven’s Henagar College. For additional information about participating or sponsorship opportunities call Dawn McLain at (702) 860-2341 or e-mail dawn@writeituponline.com.